Hark, I see a bargain in the distance! Wait, no....more like in-the-right-now. Check out some things that I dig that are marked uber low. They all meet this criteria: good design, all are on sale, under $20, and high on happy. 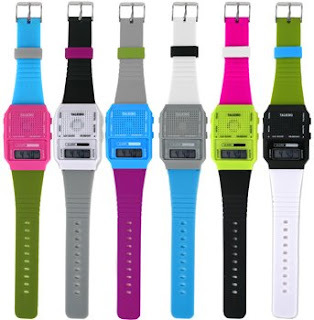 Talking Japanese Watches, FredFlare.com, 18.99 Multi-colors and solid colors for the tame. Great for answering the question, "What time is it?" in a way many people won't understand. Things to Make and Do Calendar 2008 by Nikki McClure. Yes, I know it's '09, but I am an advocate of buying old calendars for art and/or projects. At just $4.99, this Elsewheres.com find is leaves room for you to pick up this pretty note card, too. 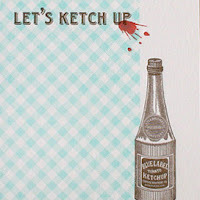 Let's Ketchup Card is a must for softening the blow of "Hey-Haven't-Spoken-in-Years-but-Can-I-Crash-Your -Couch-Now-That -I'm-Jobless-Love-Ya!" 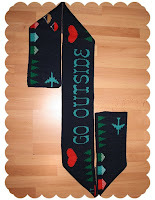 If you're chilly or plan on being that way in the next 365 days, go ahead ahead and pick up the Go Outside Scarf. At just $10, this sweet sucker is a steal thanks to CrowdedTeeth.com. "mr. p," is a real charmer and this time he's found himself in a tangled mess, for the greater good of course. Harness unruly cords with one man tied, just $10.50 at shopmodi.com. I love the idea of a talking watch.